 Four-sided shape allows for efficient stacking. communication with a broad audiences.  Molded-in slots for easy handling.  ANSI and OSHA compliant color and graphics**. Flashing hazard light, fits 25 3/4"
Lock-in sign holder for 25 3/4"
Lightweight and versatile, but makes a heavy statement about safety. 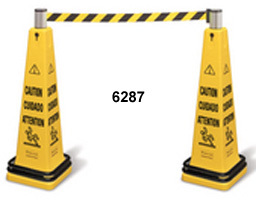  "Closed" and "Caution" warning messages imprinted in English, French, and Spanish.  Folds for convenient storage and transport on Janitor Cart or Rim Caddy.  Two- and Four-sided models available. Floor sign with multi-lingual "Caution"
Lock-In Sign Holder, Stacking, Multi-lingual, and Floor Signs from your source for material handling equipment.